Sanja Matsuri is one of the major spring festivals in Japan. It is held in Asakusa on the grounds of the Senso-ji temple. The origin of the festival dates back to the 7th century. It is, in essence, a Shinto festival with religious elements but over the years it has grown into a huge celebration. Around 1.5 million people go to the festival every year. Tourists abound because it is held in the traditional area of Asakusa, the most well-preserved traditional part of Tokyo. Get to the grounds of the Senso-ji temple from the Asakusa Station. This is one of the most stunning areas of traditional Tokyo, so walking through that area in itself is pleasant. This is a festival of high intensity so expect lots of people and a lot of noise. Some traditional performances of flutes and Japanese drums should be heard wherever you are. There are loads of food stalls that set shop just for the festival, so make sure to enjoy festival foods and alcohol. You can have shaved ice, ramune drinks or yakisoba among many other things. If you want to know more about festival foods in Japan, check out the link below. To get to the grounds of the festival, go through the Kaminorimon (Lightning Gate) and walk through the Nakamise Shopping Street. This street is not part of the festival per-se but it is right adjacent to it, so on top of the pop-up stalls, you get to enjoy all these quaint little shops along the famous street. MUST-EAT Street food at Nakamise Shopping Street, Asakusa! Omikoshis are ornated floats in which, according to the Shinto tradition, deities reside. Sanja (三社) literally means three shrines. 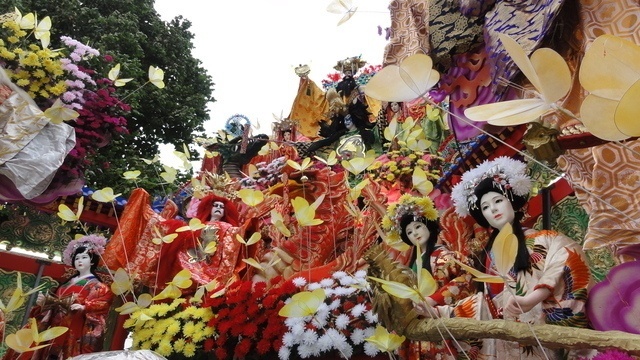 The festival is a celebration for three deities that each has its own huge omikoshi. They have to be carried by some 40 people. Carrying the float around is a way to spread good luck. Dozens of smaller ones are also carried by different groups. The Sanjo Matsuri is a rare event in Tokyo where you can see real geishas not dancing, but doing taiko (traditional drum) performances. These are performed during the weekend and require a ticket purchase. The Yakuza have a special relationship with the Shinto festivals for some historical reasons. You will often see them there. The Sanja Matsuri is the most prominent in terms of Yakuzas displaying their tattoos for the general public. They will even be standing on some of the floats! The 2019 edition will be held from May 17th (Friday) to May 19th (Sunday). The three main omikoshi will be carried on the last day of the festival. This is the most important event. If you can't make it during those dates for the Sanja Matsuri, make sure to go to Asakusa just the same! The area is one of the most beautiful and interesting places for in Tokyo. Things to do in Asakusa: the Ultimate Guide!